Chesapeake Bay Foundation Hampton Roads Director where she works to improve water quality of area waterways that feed into Chesapeake Bay. Imagine taking the world's largest cruise ship and dumping it into a landfill 700 times a year. That's how much trash new building construction and demolition produces in the U.S. alone - that's approximately 160 million tons of sometimes toxic trash. When we think about building for the future and what kind of legacy we're going to leave for our children, we need to revisit simple solutions like reduce, reuse, and recycle. Twelve months ago, the Chesapeake Bay Foundation broke ground on the Brock Environmental Center -- what will be one of the most energy efficient and environmentally smart education and community centers in the world. When completed later this fall, the center intends to meet the strictest LEED Platinum and Living Building Challenge environmental standards. So for past year and a half, we've been dumpster diving to salvage and use materials for the Brock Center that otherwise would go to the local landfill. 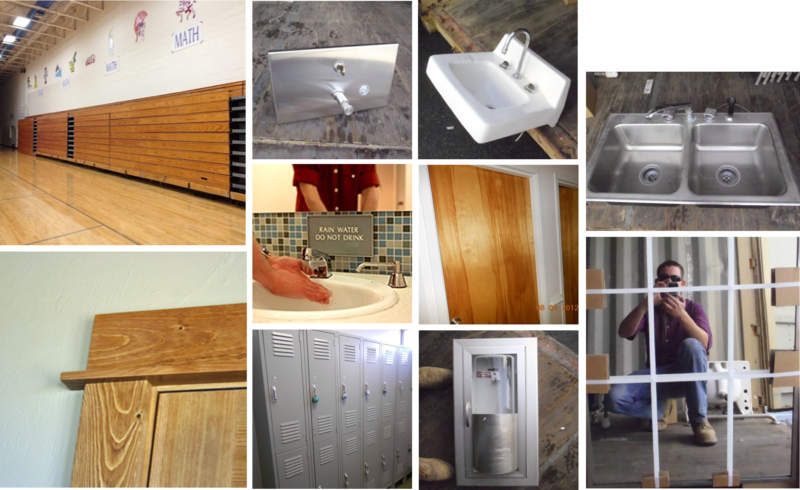 Here are just a few of the materials we've been able to reclaim along with the help from our builder and the Hampton Roads community: used sinks, doors, mirrors, counters, and cabinets from office buildings about to be remodeled or torn down were salvaged and will find new life in the Brock Center; old wooden school bleachers were saved and used as trim for the new center's doors and windows; maple flooring in the gymnasium of a former elementary school was removed, reinstalled, and resurfaced as new flooring in the center; used bike racks came from a local parks department; hundreds of champagne corks were collected for use as knobs and drawer-pulls in the center; student art tables will be used as counter tops; and old wooden paneling will be made into cabinets. A few of the salvage materials used at Brock Environmental Center. 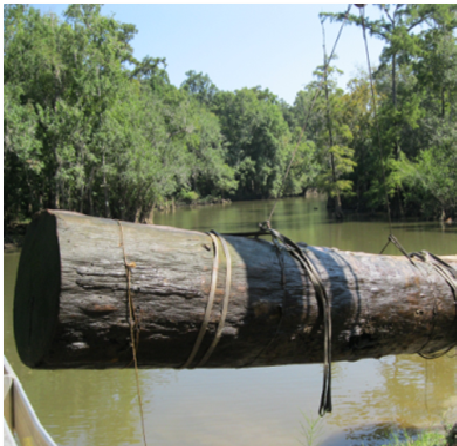 Our most unusual find, however, was the "sinker cypress" logs recovered from rivers and bayous in the Deep South. The logs are from first-growth cypress trees cut down more than a century ago but lost when they fell off barges and sank on the way to Southern sawmills. The recently recovered logs -- some of which are 500 to 1,000 years old -- have been milled and used for the exterior siding of our new building. Instead of lying submerged forever in the mud of a Louisiana river bottom, these ancient cypress logs provide beautiful, natural, chemical-free weather-proofing for the new building. 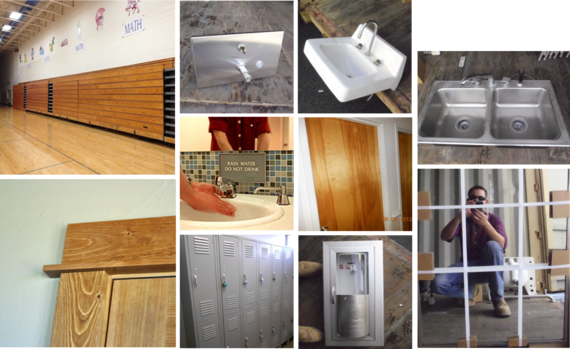 The biggest lesson I've learned from all of this work is that you don't need new materials to build a new building. Twenty-first century buildings should use as much salvaged materials as possible in order to reduce waste and pollution and ensure that we can pass along a healthy planet to our children and grandchildren. Our salvage and recycling efforts at the Brock Center, along with other innovative, cutting-edge technologies (solar and wind power, rainwater reuse, composing toilets, and natural lighting and ventilation, to name a few) reflect a deliberate effort to live our "Save the Bay" mission. The goal of the Brock Environmental Center is to integrate and support the surrounding Chesapeake Bay environment. By engaging the greater community in our recycling efforts for the Brock Environmental Center, we're also helping educate citizens on smarter ways to build, live, and work near sensitive ecosystems like the Chesapeake Bay. The Brock Environmental Center not only raises the bar on smart buildings; it can serve as a replicable model for raising community awareness in localities around the country and the world. The old elementary school gyms floors being removed before the school was demolished. Partnering with CBF to create the Brock Environmental Center are SmithGroupJJR, Hourigan Construction, Skanska and WPL Site Design.